In a week, serious soldier Elena Rodriguez gets to meet the man who won her heart with words, but only if she doesn’t let longtime friend Zack get in the way. Zack Benson wrote letters. And in writing them, made the woman of his dreams fall in love with him. Now she’s home again and he’s not sure he can live up to the fantasy she has created. After all, Zack has been like a brother to her for years. Can Zack convince her that he cares or will the history they share be a stumbling block to happily-ever-after? 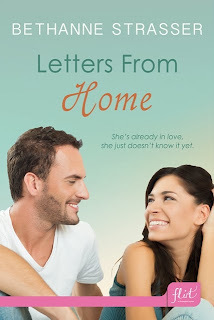 Bethanne is a woman, imperfect yet trying–a wife, mother, friend, and lover. She writes romance–suspense, contemporary, and an occasional paranormal. Her stories are full of life, family, and love. You can find her reading just about any genre of romance, but her favorites are fast-paced suspense, where life is on the line and love is the only saving grace. She's a member of RWA, PPRW, CRW, and PPW. She has one self-published novel and is also contracted with Boroughs Publishing Group. When not writing, she can be found hanging with her handsome soldier husband and their five children. She loves to read, cook, watch movies, run... okay, too many things to list!! You can find her on Facebook, Twitter, and Pinterest. Contact Bethanne by way of email: bstrasser35 @ gmail.com. Pillow Talk in Public: Is it Worth It?